One year ago, on the 7th of February 2013, the first Geocities screenshot appeared on One Terabyte of the Kilobyte Age Photo Op. Since then a new one was coming every 20 minutes (apart from several glitches that led to some hours of silence).25 666 pages were posted till this moment. And we still have material for 13 more years. 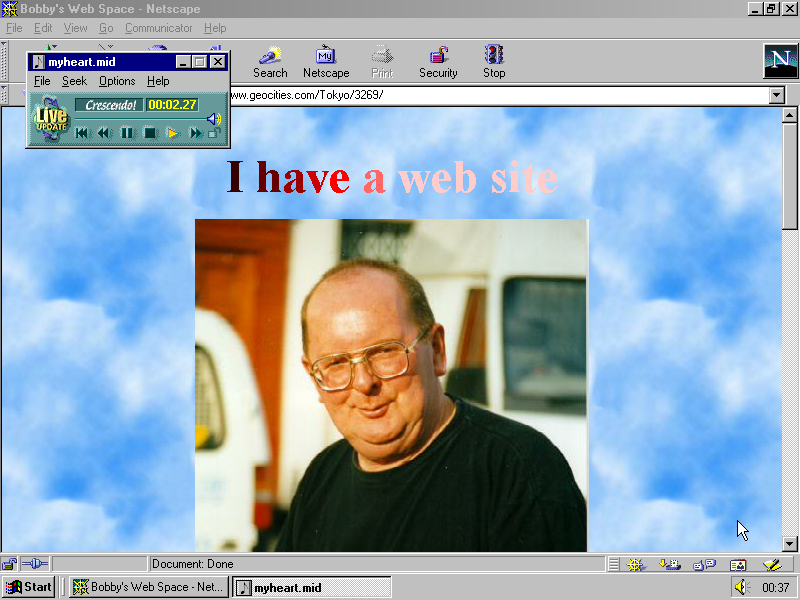 There are many things we learned about Geocities and the Vernacular Web in general from observing our own Tumblr: we found examples for our statements and theories about the early web and had to face some facts that we were not aware of before. And we got almost 9000 followers. Which doesn’t bring us to any Tumblr top list, but we are very happy about this number. Because these are 9000 people voluntarily receiving a snap of the web history 3 times an hour. They like and reblog, they give us feed back and spread the word. Seeing what pages are getting popular and what are ignored helps us to understand what web users of today find exciting about the web of yesterday. It is too early to make statements about it after one year, but the time is right to celebrate our followers’ activity during the first year. To do so we put together Top Three of the most popular Geocities Screenshots, by manually tracking the activity of tumblr users on the blog. Now we invite you to visit the mirrors of the three restored home pages. To restore your beloved pages, Dragan dug deeper into our own archive’s subfolders, went to archive.org, reocities.com, examined parts of Geocities still accessible online. Read more about it in Dragan’s elaborate post The Anniversary Restoration. See the pages in your own browser, surf (external links will be mostly broken), read the guest books! Published on JANUARY 4, 2014 (11:20 AM) got 6630 NOTES so far. Published on AUGUST 3, 2013 (2:20 PM) got 9157 NOTES so far. Who do you wanna see as the Cute Boy of the month, March?? Click here to vote! Published on APRIL 28, 2013 (2:20 AM) got 10412 NOTES so far. This page is to support all of you divorced fathers that have encountered grave injustice in the Family Law issues due to the blindness of the Canadian Justice System. It is my life long goal to show the Government law makers of Canada, that it is time to change the law.